Bound to international laws, prescribing that overseas freight containers must be sealed so that they remain protected during the transport chain effectively against unauthorized access. High Security Seals can only be opened with heavy equipment. Ferrotec is more than just a product supplier. Do you need specific advice? We're here to help. We offer a variety of Indicative, Security and High Security Seals. The offer of Ferrotec product family is huge and extends to computer seals, reusable locks and all type of seal accessories. Security is the top priority for you? Discover our wide range of high security seals. Your deadlines are ours, so it's important for us not to keep you waiting. Stop the time and convince yourself of our 25 years of experience! Initially developed only for the Ferrolock, the Removeable Security Sticker RSS® is now available for almost every product. 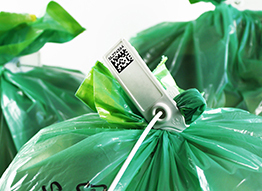 The assistance, which can also be processed electronically via barcode, saves valuable time and prevents transmission errors. The RSS® by Ferrotec is not only scratch and tear resistant, but is also water and smudge resistant and resistant to weather conditions. We also offer the original RSS® in multiple versions. Ferrotec's RSS® eliminates transmission errors and streamlines your workflow. For questions or suggestions, we are of course available with advice and assistance. We support the International Football Cup, because youth sport is an excellent way to show performance and at the same time live a fair deal with others according to clear rules. The interaction with people from other nations is becoming more and more important for the newcomers and is only to be achieved with appreciation and fair play - we at Ferrotec make us strong: from the beginning, a lifetime! At FERROTEC, we know how important and valuable the fair, friendly and respectful approach to customers, partners and colleagues is. With the FAIR PLAY AWARD, we want to arouse the interest of the youth in these qualities and actively promote fairness. Thanks to the high qualification and the more than 25 years of experience in the field of logistics safety, every FERROTEC requires a high degree of quality, flexibility and reliability. And the trust into the company by its clients is very well appreciated by FERROTEC and repaid with great commitment. The company's productivity is underpinned by the broad range of product lines and their product subgroups. With another security add-ons you can be sure about the location of your transportation goods: QGO® - The Tracking Network! For the third time Ferrotec supported the International Youth Footbal Cup on 12.05. – 13.05.2018 in Bad Oldesloe with the FERROTEC FAIR PLAY AWARD. Use our contact form or call us, we'd like to help! Seals are used in applications where must be ensured that no one makes unauthorized tampering with the cargo, or settings can be manipulated to specially protected objects. 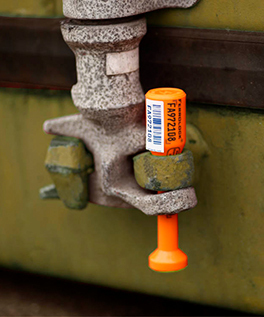 In the area of the cargo, container seals include protection for truck, rail or sea transport, for example, Bolt seals or in the form of cable seals. For each application, and all types of transport containers, there are very specific security labels, valuable or dangerous goods effectively protect against unauthorized access. In addition, one-way mark are for emergency cases or in fire extinguishers to ensure that of these only for emergency use is made and the maintenance personnel can see at a glance when fire extinguishers or emergency kits were used and the content must be re-examined. Other important locations are electricity, water or gas meters. This prevents the seal that the counter can be manipulated. And these are just a few of the possible locations of Indicative, Security or High Security Seals. We offer a number of Indicative, Security and High Security Seals. The product line of FERROTEC is huge and extends to computer seals, reusable locks for cargo protection and all types of sealing equipment. Even simple packages can be sealed effectively by the way: This is done with a special security tape that leaves when removing a pattern on the package. So you can later verify whether the package has already been opened and whether it is the original security tape. International law requires that overseas freight containers must be sealed to keep them during the transportation chain is protected from unauthorized access. To meet the stringent safety regulations, High Security Seals must be used in accordance with ISO 17712:2013 certified and are extremely difficult to manipulate. High Security Seals can only be opened with heavy equipment. Moreover, each of our certified Ferrolock seal is provided with a code. Every number code only once, so that an unauthorized open containers are sealed not go unnoticed with a new seal. Finally, the use of any high security seal to be seated by documented and possibly demands by police or customs authority to be registered to understand. 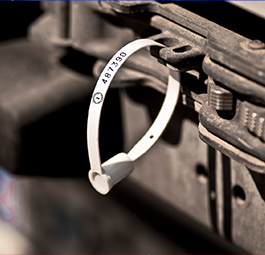 But no matter what application you High Security Seals to secure cargo - we have the best seals for any purpose. Request our expertise! We will advise you by phone at extension + 49 (0) 4533 / 20870 0.